An early DTH, available on newspapers.com. 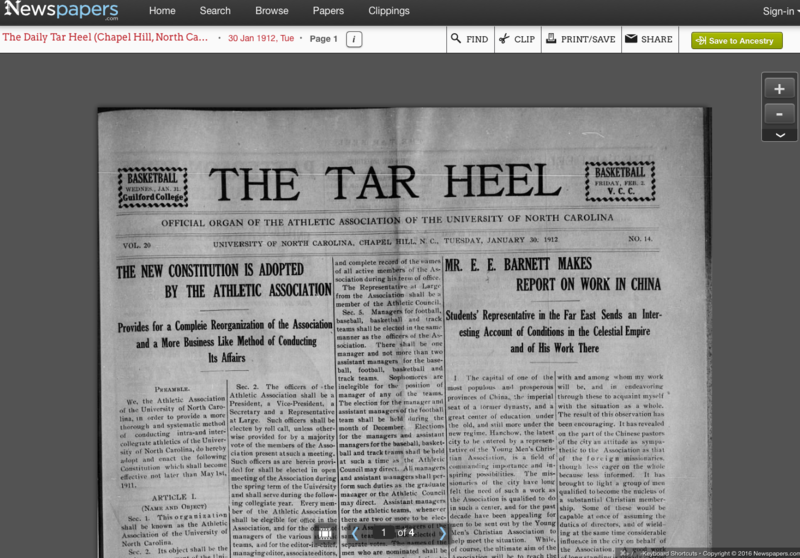 This archive is digital and searchable, from the very first DTH in 1893 to the end of 1992. You can search by date as well as keyword, and see very clear, easy-to-read versions of the pages. It’s a bit of a rabbit-hole, so be prepared to lose all sense of time as you stare, mesmerized, at DTH history. The bound volumes of DTH pages are available in three locations: A complete archive is available at Wilson Library. About 100 years of bound volumes are also at the Park Library at the School of Media and Journalism. Bound volumes from about 2000-present are at the DTH office at 151 E. Rosemary Street. A Davis Library librarian maintained this searchable headline archive for many years; he has retired. This headline archive aids you in your search through bound volumes or microfilm. Locate the headline you want, then note the date and page number. The first 6-8 years of the DTH’s online presence was at www.unc.edu/dth. You can access stories from fall 1994 to about 2000 at this link, thanks to the Wayback Machine internet archive. Searching is by date only; target your search by using the Davis Library headline archive. The archive of stories available on the current DTH website isn’t 100 percent complete but has most stories published from 2002 on. Pro-tip: Google is a better search engine than the one of the DTH site. Google “daily tar heel” plus your search term.